I'm not ashamed to admit: I'm a huge Call of Cthulhu fan. It doesn't hurt that I'm also a huge fan of the works of H.P. Lovecraft and his coterie of weird fantasy writers. But I love the game for more than just its Lovecraftian elements. Personally, I think the game does exactly what a good RPG system should do: it lays in wait as the game unfolds, virtually invisible when it's not needed; it's minimally intrusive when called upon to intervene; and it supports the atmosphere of the setting without being dictatorial about it. 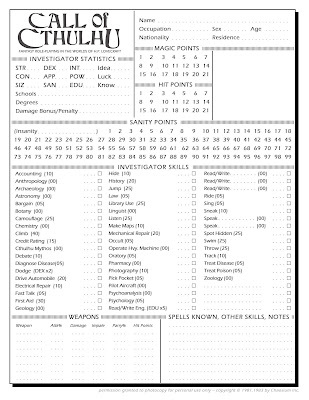 Anyway, in order to keep things rolling around here (since I'm too busy with work to take more than a few minutes to post anything meatier), here's a replica I made of the second-edition CoC character sheet. Quality electronic character sheets abound for fifth-edition CoC and later, but I've found myself hard-pressed to find one for my favorite edition of the game (third edition - the one that introduced me to the game, in a nifty hardbound book that is - to this day - my favorite book in my RPG library). Therefore, I recreated the sheet based on the only electronic sheet I could find at the time (from the second edition). I may be wrong, but I don't think there were any significant changes from the second to the third editions (significant being relative - CoC has not significantly changed since its first edition; if it ain't broke, why fix it?). 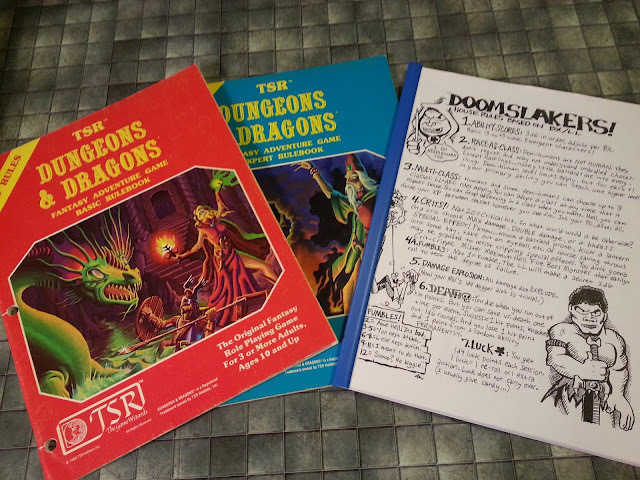 Therefore, I believe this sheet will work just as well for third-edition CoC as it does the second edition (and probably first edition, as well). Maybe we should play COC this weekend as a one off you can sick nasty creatures on me if you wish. I'll even make a new character and won't name her molly or fiona..